Here are some of our favorite books on Chinese New Year! Let's Make a Chinese New Year Dragon Puppet! We used 1 cardboard egg carton and three toilet paper rolls to create the dragon. First, I cut apart the egg carton to make 4 pairs of egg holders and teeth. Then, Chuck and I worked together to paint everything. Then, I hot glued the egg carton bits onto the toilet paper rolls, attached the two jaws together with fasteners, and glued on eyes. Then, I hot glued the head and body parts onto a long piece of ribbon. Then, I poked and hot glued one straw into the second body segment. Then, I cut the tip of another straw in half and poked it through the bottom jaw. I used a piece of packing tape to keep it in place. And now we had our very own dragon puppet! Just move the straws up and down to make your dragon dance! Looking for other ways to Celebrate Chinese New Year with the Kids? 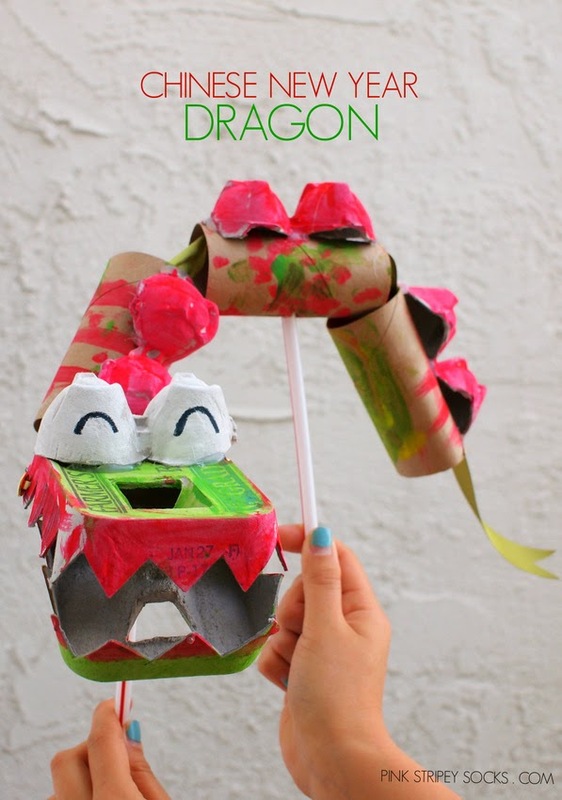 Click here to find more Chinese New Year Crafts to make with the kids! Click here to see a list of Chinese New Year Picture Books to read with the kids. And it's always fun to give the kids Chinese Red Envelopes filled with these !